January 2018 Update: We've Incorporated! After 15 years of building up our garden and our community, we are excited to announce that Oakland Sustaining Ourselves Locally has officially incorporated as a 501(c)3 nonprofit as of January 2018! 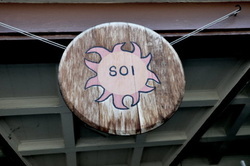 In the Spring of 2003, the first six members of SOL moved into the space at 1236 23rd ave, at International Blvd, in Oakland. 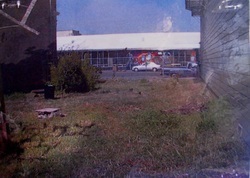 They saw the empty storefront and vacant lot in back as full of potential, and dreamed of eventually having a full production organic garden, orchard, and space for building community. An important priority in the conception of the project was actually living the life they believed in, and sharing possibilities of living in ways less harmful to the earth. They began to dig into the earth and uncover many pounds of trash and rubble, amend and repair the soil, and eventually grow their own food. They build a greenhouse from all reused materials, and dug a pond to serve as part of the garden ecosystem. Chickens were adopted to provide the community with fresh eggs, friendship, and act as an educational tool when groups came to visit. 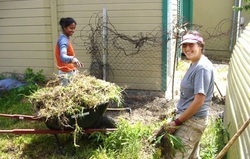 SOL was soon equipped with a grey-water system, expanding garden and food production, three-tiered composting system, and nine residents sharing three apartments over the storefront. Programming developed as SOLmates welcomed community school groups to come for educational tours and activities in the garden.